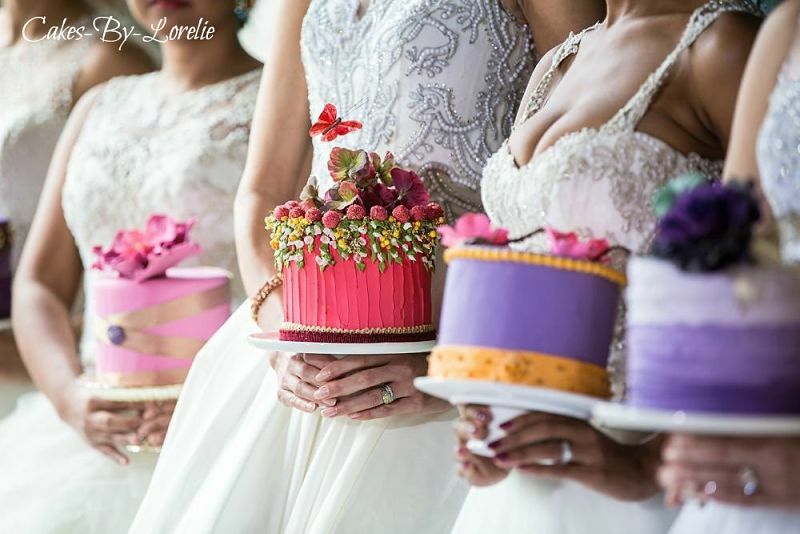 I absolutely LOVE a challenge...especially if it involves wedding cake designs, so when Jen Weller owner and CEO of Ever After Bridal asked me to participate in a fantasy photo shoot with my cakes as pretty props, I was beyond thrilled. 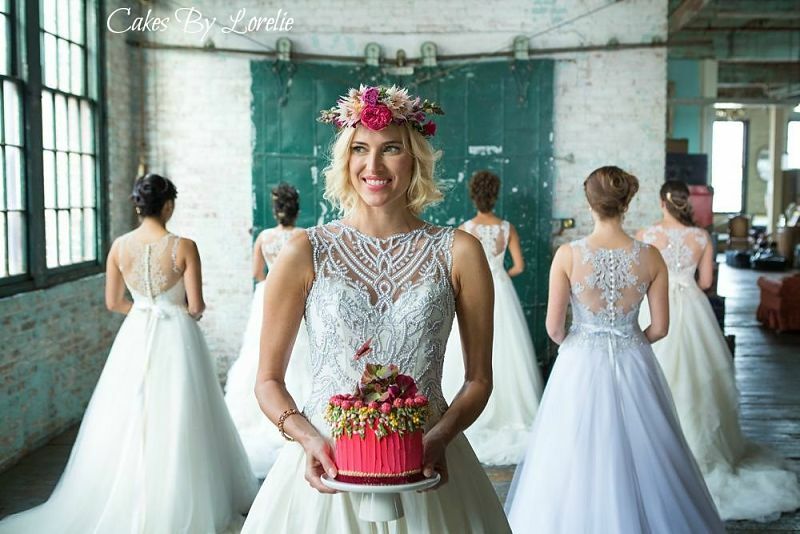 Her "Real Housewives" themed bridal shoot took place at the revived Metropolitan Building, a truly unique spot in Long Island City New York, with six of her Veluz Reyes brides...Wow!!! Just take a peek at these amazing photographs by Kiva of Annandale Photography. 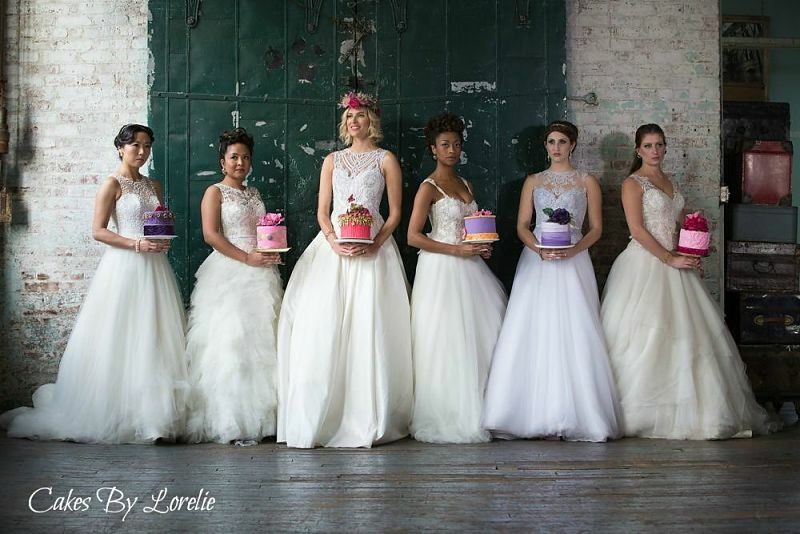 I am so very grateful to have been asked to be a part of this project :-) To have these gorgeous photos of six beautiful brides in a row posing with my cakes is priceless. As you probably have guessed these are faux cakes made from styrofoam. Although they are not real the frosting and fondant are made of sugar. To be totally honest, I would rather bake and decorate a real cake anytime. These innocent looking little dummies are not so simple...but I did know full well that this would not be easy. I also knew that it would be well worth the effort. The photos were to be published by one of the world's largest wedding blogs. Here is the link to the full post at Strictly Weddings featuring the six beautiful brides in their Veluz Reyes bridal gowns with my wedding cake designs. With two weeks to order supplies and get the job done I got right on it and did manage to take some video while working. The video is a fun visual with great music and fabulous photos from Annandale Photography. Enjoy! Because the colors were a crucial part of this project there was plenty of experimentation with food color and small pieces of fondant. This was probably the biggest challenge. After all brides cakes are usually white or soft pastel colors, so to come up with six ways to do deep pink or purple...well let's just say it wasn't easy. From hairstyles to flower arrangements and even a few cake designs, Jen shared a collection of her thoughts and ideas through a Pinterest board which was so helpful. I was VERY pleasantly surprised, when the blog post came out, to see just how well the colors of the cakes and flowers matched. Just look at this floral headpiece by Earthy Elegance and how perfectly the raspberry colored cake went with it. The very first of the wedding cake designs to be completed turned out to be my favorite. It also happened to be Kristen Taekman's favorite. Yes, there was the added celebrity tease to this as well. Kristen is one of the stars of TV reality show Real Housewives of New York. I heard through the grapevine that Kristen's daughter received the raspberry cake design at the end of the day :-) That is so sweet! I admit that the cakes had a rough start. Applying fondant over dummies can be difficult. I learned from this experience things I should have already known or remembered, but alas did not. (looks like I am the real dummy LOL) If you are a decorator reading this and want to learn about covering a dummy cake with fondant...here are some valuable tips. Sand the edges of the styrofoam dummies first. (shown in the video) The edges are sharp and can rip and tear your fondant. Use a super light coat of either shortening or a mist of water over the styrofoam prior to covering it with fondant. This helps the fondant to stay put. If you use a royal icing, as I did with my first dummy, use a light application. The fondant will get mushy and slide right down the sides. Thanks again to Jen Weller and her entire crew for a truly great experience and awesome photographs.